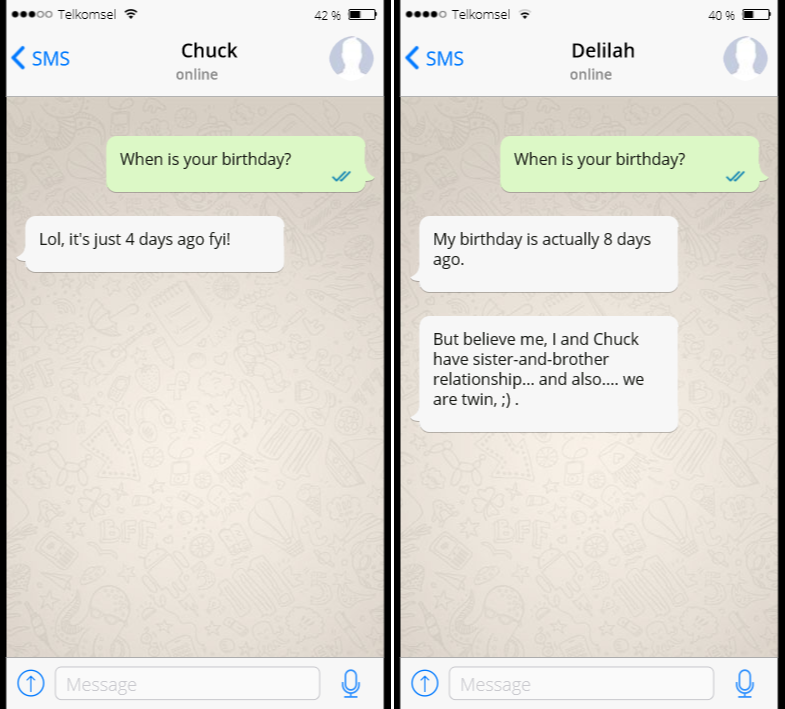 Chuck replied fast: "Lol, it's just 4 days ago fyi!" and 20 minutes later another member, Delilah, said: "My birthday is actually 8 days ago." Not only that, she also wrote another message: "But believe me, I and Chuck have sister-and-brother relationship... and also.... we are twin, ;) ." So here is the puzzle for you: Please explain what happened! Is it possible that Chuck and Delilah are really twin? their mother was in a boat which was going east. She gave birth to Delilah on 27 February at some time around 11:59 p.m. Then, the boat crossed the International Date Line which made the date 28 February. And because of the 11:59 p.m., it soon became 1 March. Then, Chuck was born. you first asked Chuck some time on 5 March after 11:40 p.m. when it was a leap year. He answered that his birthday was 4 days ago. 20 minutes later, when Delilah answered, it had become 6 March. So, it was actually 8 days after her birthday.